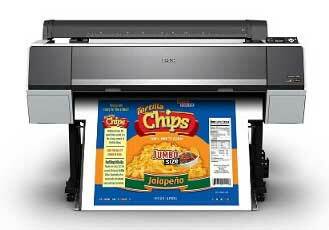 Epson SureColor SC-P6000 and SC-P7000 (P8000 and P9000) initial release info. Updated as we find it. The inks have been reformulated and are supposedly offering denser blacks. I’ve seen this in the P800/P600 I reviewed earlier this year, although don’t expect it to jump out at you. The 7000/9000 have the option of using a new violet ink instead of light light black, to expand the gamut in some areas. This is very much aimed at graphics and proofing, so not the choice for photo printing. Note that once you make the Violet/LLK decision, you can’t change back. 24th September 2015 – Today Epson unveils four new SureColor SC-P large-format printers designed to meet the needs of the professional photo, fine art and proofing markets. Additionally, the SC-P9000 and SC-P7000 provide the ultimate proofing solution. Building upon Epson’s solid reputation in this market, both models ensure highly-accurate prints with colours that will remain consistent throughout the print run. Using Epson’s 10-colour UltraChrome HDX ink-set, incorporating a new violet ink, both models can produce a wide spectrum of colours achieving 99% of the Pantone® colour library for highly accurate spot colour reproduction, making these two printers the most colour accurate large format printers on the market utilising 10 colours or less. These models are also available with a Light Light Black UltraChrome HDX ink configuration that replaces the violet ink making them ideally suited to high-end photographic and fine art applications that require the ultimate in print quality for both colour and monochrome reproduction. All models are available bundled with Epson’s off carriage, inline SpectroProofer incorporating the ILS30 colorimeter, jointly developed with X-Rite. Conforming to the new ISO lighting and measurement standards – including M1 – this solution ensures consistent, repeatable colour accuracy regardless of media. The SpectroProofer solution also enables printer calibration performed with Epson’s new Color Calibration Utility, an easy-to-use, fast calibration tool that can be used to ensure consistent colour across a fleet of printers. Because the calibration data is stored on the printer, support for multiple users is much simpler and the calibrated data can be used for all media types including third party. Ideal for long print runs, all models come with high-capacity cartridges, while the printers’ low power consumption can help save on energy costs. Additionally, thanks to a superior lightfastness, prints will continue to look their best long after they are created. In fact, prints on Premium Glossy Photo Paper can last up to 60 years .